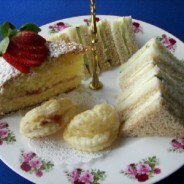 A tea meal in grand style, served on a two-tier cake stand. 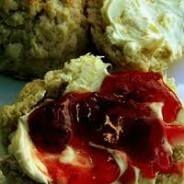 Our large freshly-baked scones with cream and strawberry jam. 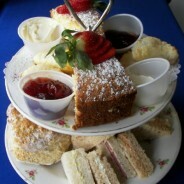 Two slices of Queen Victoria sponge cake, assorted finger sandwiches, and our homemade pastries with tea for two. You may choose 2 different teas in individual teapots, and refills are available of the same tea. If you choose another tea flavor it would be a small upcharge. You may have a Windsor for one, ($18.00), or for three ($54.00). 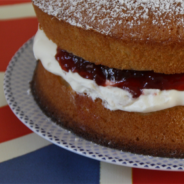 Traditional cucumber sandwiches (made with butter and cucumber slices) with a slice of Queen Victoria sponge cake and our homemade pastries with tea for one. 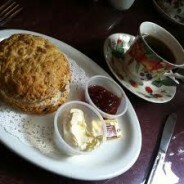 One of our large golden raisin and vanilla scone’s served with our home-made cream, butter and strawberry jam. Served with a pot of tea for one. A real English classic. A special treat for children of cheese & butter sandwiches, peanut butter and jelly finger sandwiches, with a slice of Queen Victoria sponge cake, and cookie’s. Choice of hot chocolate or ice cold milk, or lemonade. A large golden raisin scone with a hint of vanilla traditional English scone served with butter, strawberry jam & our home-made cream.